If you could do a few simple things each day that would make a massive difference to how you age, how long you live, how healthy you are, how much energy you have and how you look...would you? Eat Less, Live Long is a guide for people who are willing to change and want to get healthy, but don't know how. Today we live in a world where we never stop eating and we consume the worst kinds of food, resulting in extreme numbers of sick people suffering health issues ranging from obesity to cancer. For the first 25 years of his life, Jason Shon Bennett was sick with asthma, hay fever, allergies, bad skin and bowel and digestive problems, and needed daily medication. 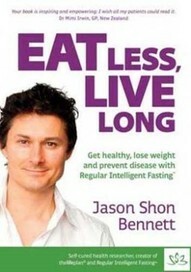 In this book, Jason shares his many years of personal experience and extensive research relating to the world's healthiest diets, the medicinal properties of foods, and the practice of Regular Intelligent Fasting. Through applying these learnings in his own life, Jason transformed his health. Now, at age 46, he has exceptional health and has not been sick, taken medications, or had a cold or illness for over 20 years. Learn how he did it.